However, we are going to be adding it to the WordPress plugin. So we just need the Tracker ID which is a little bit further down. So just copy that onto your clipboard and next flip over to your WordPress admin center so you can add the Jumplead plugin. Search for and install the Jumplead plugin. Once it's installed you can activate it. 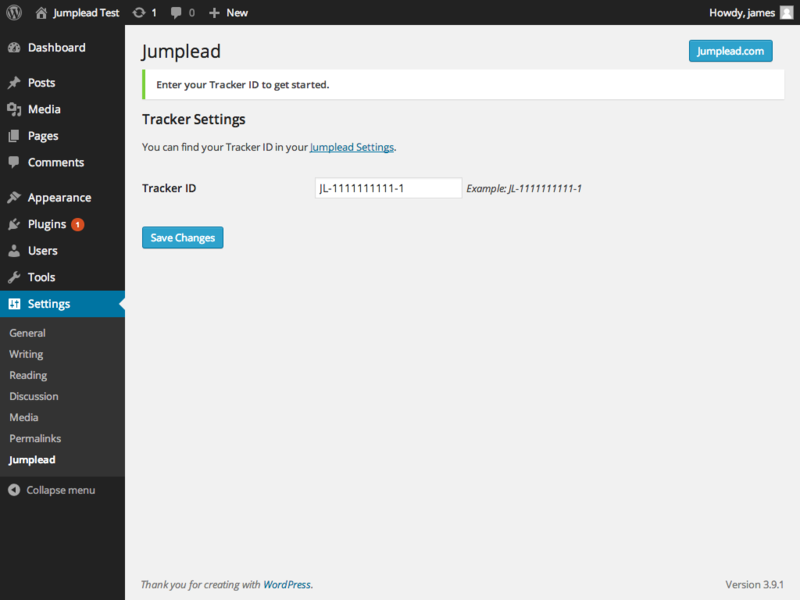 And a new Jumplead section will be added to your left hand navigation inside WordPress. Clicking on the new Jumplead navigation option in WordPress will take you to the Jumplead plugin page, which has a cover page that tells you what you can expect to be able to do with Jumplead. And some links that will allow you to log in to the Jumplead admin center. There is also an integrations section that will allow you to hook up Jumplead with other popular WordPress form plugins. But what we need is the Settings section as that's where we need to paste our Tracker ID. If you just make sure that's saved, you can then flip back over to your website and have a quick click around. It's important to do this because it sends data over to Jumplead to activate the system. Then navigate back to Jumplead and go to the Activity section. There you can see your visit. So there we go. 3 minutes and the WordPress plugin is in, the tracking code is set up. And you're in a great position to be able to start adding conversion forms.